I have installed CentOS on Windows VirtualBox host. I had initially allocated 50GB but I ran out of space so I extended the vdi to 100 GB and then used a GParted live CD to extend the lmv2 pv partition from 50 GB to 100 GB. When rebooting to CentOS it remained 50 GB. So I reshrinked the partition. Anyway it looks like this after reverting the change. I really don't know whether this is a Linux or VirtualBox question. Any insights? Resize the VDI and partition, like you did before. Not the answer you're looking for? Browse other questions tagged centos partition virtualbox or ask your own question. 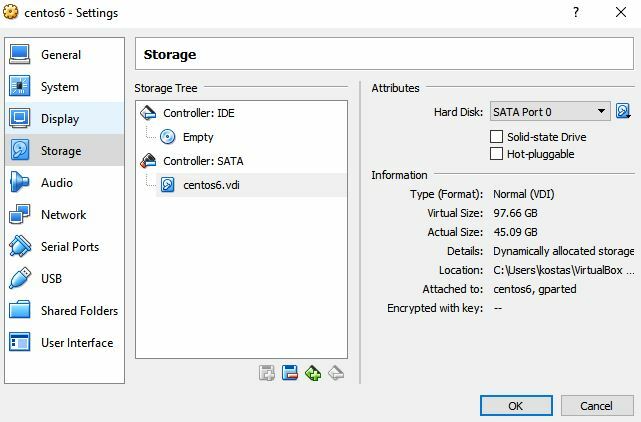 Increasing the size of RHEL virtual hard drive in Virtualbox? why resize a PV instead of adding a new PV?